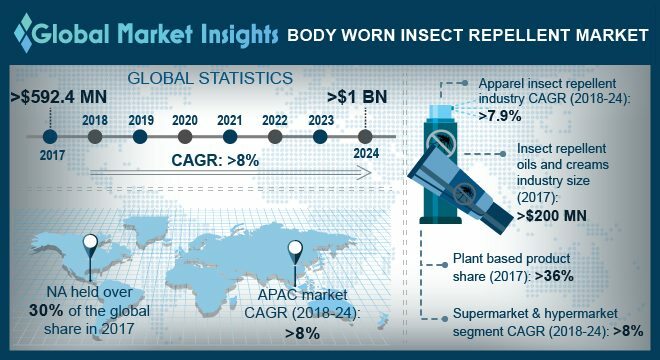 Global Body Worn Insect Repellent Market size is estimated to exceed USD 1 billion by 2024; according to a new research report by Global Market Insights, Inc.
Increasing incidences of arthropod borne diseases across the world is a major factor leading towards body worn insect repellent market growth. Growing healthcare awareness programs to create consciousness among consumers also stimulates the demand for bug resistance products. Severe efforts taken to prevent epidemics is likely to play a key role in the increasing adoption for these repellents in the upcoming years.